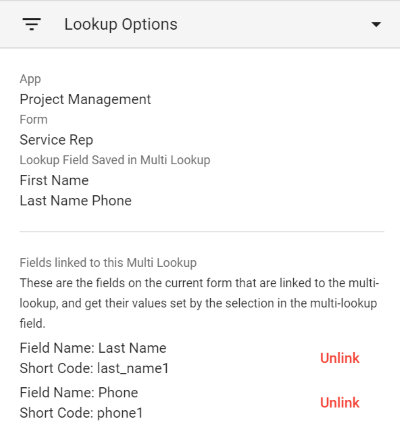 A Multi Lookup field is like a List Selection field, except it allows you to look up more than one value in a single selection action. For example, you might have a help desk application, and when select the service rep’s first name you could also have the rep’s last name and phone number pulled into the record at the same time. 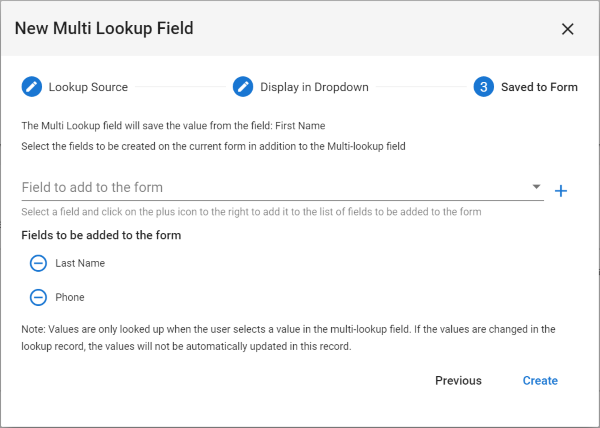 Adding a Multi Lookup to a form will start a wizard to help you configure the field correctly. The wizard has 3 steps. In the steps below we will continue with the example of a help desk application, where you want to lookup the service rep’s first name, last name and phone number in a single selection action. In this step we tell GW Apps where to lookup information from, just like in List Selection fields. You select the desired app to lookup from, and the form in that app to lookup records for. The App to Lookup from will be pre-filled with the current application name. 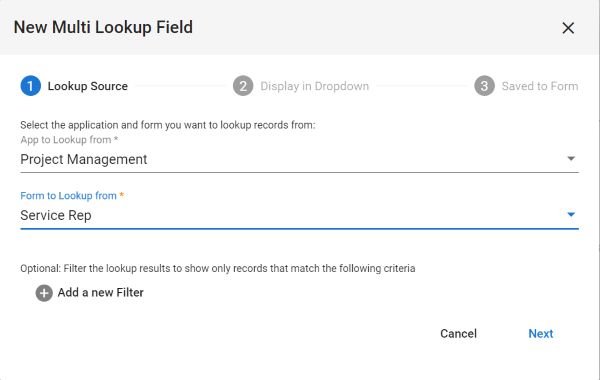 From to Lookup from The form in the selected app to lookup records form. 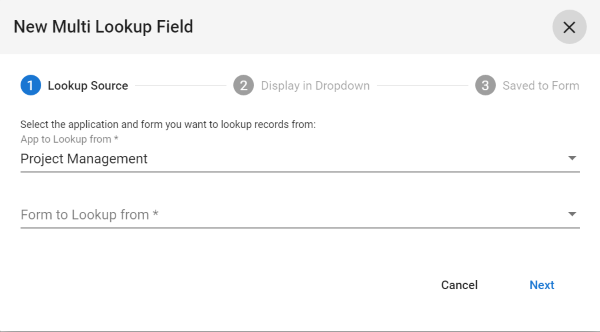 In this step we tell GW Apps what fields should display in the dropdown of the Multi Lookup field on the form when the user is making a selection. List Selection fields show only a single column of values, but the Multi Lookup can display multiple columns of values in the selection list. Field to add to the lookup dropdown This is a list of the fields on the selected form. Select the desired field from the list and click on the + symbol at the right side of the field to add it to the current list. Fields to display in the Multi Lookup dropdown The current list of field values that will be displayed while a user is making a selection in the Multi Lookup field. The up / down arrows can be used to change the order of the fields, and the minus sign at the left of the field name can be used to remove that field from the list. The first field in the list will also become the value actually stored directly in the Multi Lookup field. In this step we tell GW Apps which field values to add to the record after the user has completed their selection. We can add some or all of the fields displayed in the dropdown, and we can also add fields not displayed in the dropdown. Field to add to the form This is a list of the fields that will be added to the record after the user has completed their selection. Select the desired field from the list and click on the + symbol at the right side of the field to add it to the current list. Fields to be added to the form The current list of field values that that will be added to the record after the user has completed their selection in the Multi Lookup. The up / down arrows can be used to change the order of the fields, and the minus sign at the left of the field name can be used to remove that field from the list. 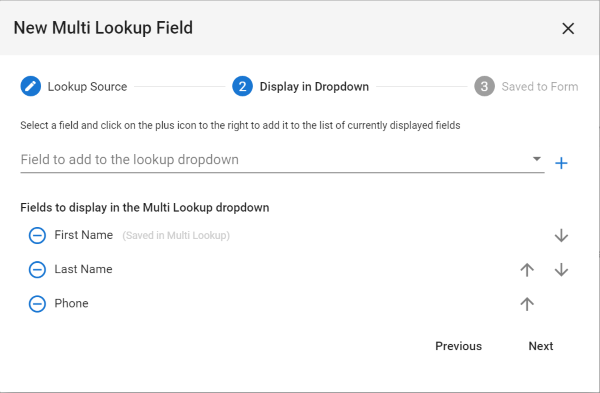 The first field in the dropdown display list will always become the value actually stored directly in the Multi Lookup field. As this field is already taken care of, it is not displayed in the list of ‘Fields to be added to the form’. Shows the selected app, form and field value stored in the Multi Lookup. Fields linked to this Multi Lookup Shows the additional fields added to the form by the Multi Lookup wizard. 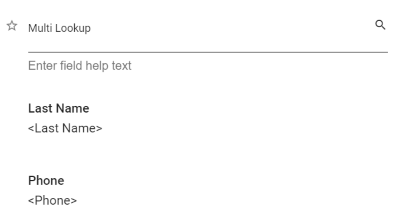 Unlink Clicking on the Unlink option will turn that field in to an ordinary field of that type (Text, number or date). It will no longer have its value set when the user makes a selection in the Multi Lookup list. Allows to filter the records displayed when the Multi Lookup selection list is displayed.